Royal Challengers Bangalore 185-5 (Tillakaratne Dilshan 71, AB de Villiers 47*, Amit Mishra 2-28) beat Deccan Chargers 181-2 (Shikhar Dhawan 73*, Daniel Harris 47, Prasanth Parameswaran 1-45) by 5 wickets. AB de Villiers - 'Player of the match' for his fiery knock of 47 from 17 balls. A speedy charge by AB de Villiers in the late overs outclassed Deccan Chargers as Royal Challengers Bangalore earned a majestic victory. Deccan Chargers scored a reasonable total of 181 runs for the loss of just two wickets in the allotted 20 overs and Royal Challengers Bangalore hammered 185 with five wickets in hand in 18.5 overs. 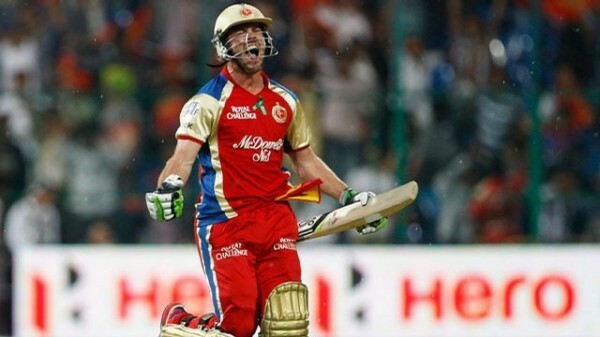 AB de Villiers (Royal Challengers Bangalore) was declared ‘Player of the match’ for his stunning knock of unbeaten 47 off mere 17 balls. The 50th match of the Indian Premier League was played at M Chinnaswamy Stadium, Bangalore, on Sunday, May 6, 2012 and the encouraging home crowd cheered their home team throughout the game. Earlier, Virat Kohli, the stand in captain of Royal Challengers Bangalore, won the toss, opted to field and preferred to chase. Daniel Harris and Shikhar Dhawan started off well as the run rate was geared up from the word go. The boundaries were flowing from their willows and the first fifty of the innings was fired in the 8th over with a couple of lofty sixes and a four from Harris. Dhawan supported him well from the other end and they produced 86 runs stand for the first wicket in 11.5 overs. Harris was unluckily run out when he was going smooth at 47 off 41 balls with 4 huge sixes and 2 fours as Cameron White appeared in the centre. Dhawan scored his half century in the 15th over with the assistance of a couple of fours as White punished Abhimanyu Mithun for 15 runs in the 17th over with one six and two fours. Dhawan kept on slogging at the other end while he got a lucky escape when dropped by Zaheer Khan off his own bowling at 72. The duo smashed 82 runs for the second wicket in just 7.2 overs when Cameron White was caught and bowled by Prasanth Parameswaran for 45 off 24 balls with 3 sixes and 2 fours. Shikhar Dhawan remained unbeaten for 73 off 52 deliveries with one six and 10 fours, the skipper, Kumar Sangakkara was at the other end at 10 as Deccan Chargers piled up 181 runs with eight wickets in hand. Tillakaratne Dilshan and Chris Gayle provided a flying start to Royal Challengers Bangalore and especially the first was more fluent with the boundaries whereas the latter hit his first four in the sixth over. Dilshan gathered 10 runs in the seventh over with one six and a four while attaining his half century with another four in the following over. Gayle escalated a couple of sixes and the score was enhanced to 91 in 10.4 overs when he was clean bowled by Anand Rajan for 26. The next two incoming batsmen surrendered within no time and Tillakaratne Dilshan was the fourth batsman who went back to the pavilion as the score touched 117 in 15.2 overs. He thrashed 71 off 54 balls with 2 sixes and 8 fours when AB de Villiers took over the charge with a reasonable support from Mayank Agarwal from the other end. The latter earned 11 runs in the 16th over with one six and a four , hit another six in the next over but lost his wicket for 18 as the total reached at 143 in 17 overs. Royal Challengers Bangalore required 39 to win the match in 18 deliveries when de Villiers butchered his countryman Dale Steyn for 23 runs in the 18th over with a couple of sixes and even fours. He continued with the assault in the next over off Anand Rajan , punished him for 15 runs from the first four deliveries with one six and two fours. Syed Mohammad swung the fifth ball out of the deep midwicket boundary for four as Royal Challengers Bangalore won the match by plundering 185 runs for the loss of five wickets with seven balls to spare. Royal Challengers Bangalore – 11 from 11 games at a net run rate of -0.333. Deccan Chargers – 5 from 11 games at a net run rate of -0.557.